Many women have to bear the brunt of the menstrual disorders. Menstrual disorders are nothing but known as dysmenorrhoea (painful periods) or irregular periods. If you are also suffering from menstrual disorders which are beyond the levels of resistance then here are some of the Yogic asanas that will help ease the effects of menstrual disorders. 1. 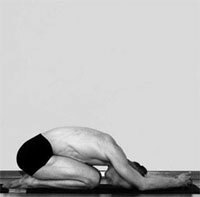 Cobbler Pose (Supta Baddha Konasana): This pose is helpful as it also helps to tranquilize the mind and lowers the blood pressure. To perform this asana, you just need to lie on the back in a way so that your head and back touches the floor. Once you lie down, hold your ankles and bring them up to your back or around your buttocks. While performing this asana breath in a usual way and then return to the original position. 2. Hero’s Pose (Virasana): This is one of the easiest yogic asanas which can help you get rid of menstrual disorders. In this asana, you just need to sit with a straight back and then slowly make your hips rest between the feet. While performing this asana see to it that your back is erect, and your toes are pointing backward. Breathe regularly and sit in this position for at least a period of 20 minutes to gain better results. 3. Down Ffacing Hero’s Pose (Adho Mukha Virasana): Sit in the hero’s pose and bend in the forward direction and then rest on the floor. While resting, see to it that your forehead touches the ground. Once done, straighten both of your hands above your head and then join your palms together. Do this twice a day and for at least a period of 30-60 seconds for better results. 4. Hero’s Pose in Lying Position (Supta Virasan): Sit in the hero’s pose or Virasan and then lean your back in the backward direction so that your elbows touch the floor. Slowly move your head and back behind and then straighten your arms above your head with your palms facing in the upward direction. Breath in a usual manner and while you return to the original pose exhale slowly. The Supta Virasan when practiced regularly and for 30-60 seconds daily can help to reduce the congestions in the pelvic organs and can also provide relief from menstrual disorders. These were some of the yogic asanas which you can practice to get rid of the menstrual disorders. However, be careful that you don’t stretch yourself too much.